“I want friend like me,” grumbled the monster. And thus, a woman... friend... wife was cobbled together. On April 22nd, 1935, movie audiences were introduced to a new member of Universal’s classic horror monsters, who still stand today without rivals in pop culture lexicon. She was the monster’s mate and title character in James Whale’s immortal masterwork, “Bride of Frankenstein”. Played by Elsa Lanchester, with less than only five minutes of screen time, she simultaneously terrified audiences and was immediately embraced as a beloved silver screen legend. A true horror archetype with her trademark lightning streaked hair she is an instantly recognizable character and an inspiration to countless homages and imitations. 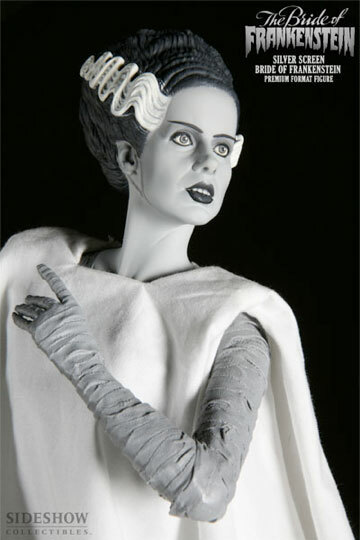 From within the stone walls of a dimly lit laboratory, the mad scientists at Sideshow Collectibles and Universal Monsters have defied nature to infuse the spark of life into this 1/4 scale recreation of “The Bride of Frankenstein”. Delicately crafted to exacting detail, with her “shock hairdo”, a long flowing cloth shroud and bandaged arms she stands elegantly posed, her neck craned exposing the patchwork stitching where she was pieced together from a multitude of corpses. Lovingly reproduced here as the tragic creature she is, both beautiful and gruesome. The perfect bride and showpiece for those who “belong dead”.